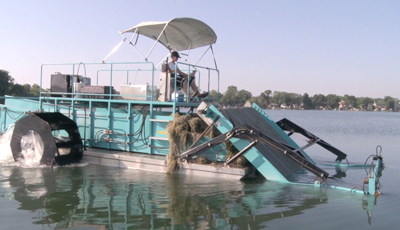 The flagship of Inland Lake Harvesters' fleet, the ILH10-1000 delivers the power and capacity to remove the toughest infestations of aquatic weeds from your large lakes and waterways. 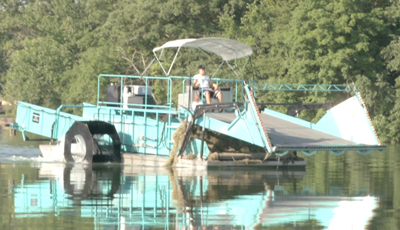 With a mighty 1000 cu ft of payload capacity and a 10'- or optional 12'-wide cut, the ILH10-1000 is your strongest partner in waterway management. The ILH10-1000 is powered by a water-cooled diesel engine or optional air cooled diesel engine and both feature high temp and low oil shut down for engine protection. 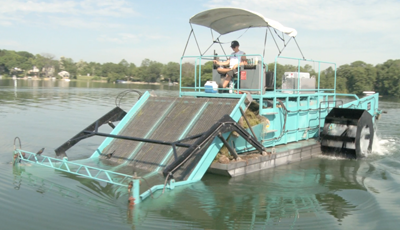 The front conveyor is equipped with a shock absorbing system to limit damage in the event of striking underwater obstacles. The ILH10-1000 is propelled by side-mounted paddle wheels that are coupled to direct-drive Hydraulic motors. The motors are low speed, high torque, and wear-compensating to increase motor life. The ILH10-1000 is built to last and comes standard with a painted steel hull or optional 304 stainless steel hull. The ILH10-1000 features stainless steel belting on conveyor #1 and heavy-duty galvanized belting on conveyors #2 and #3. The remaining surfaces of the machine are finished with a heavy marine-grade topcoat. The ILH10-1000 features a full length tower for ease of maintenance and increased safety. 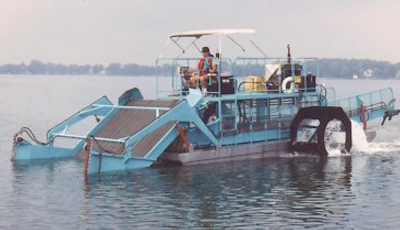 12' cutting width, shore conveyor, trailer conveyor, and transport barge.